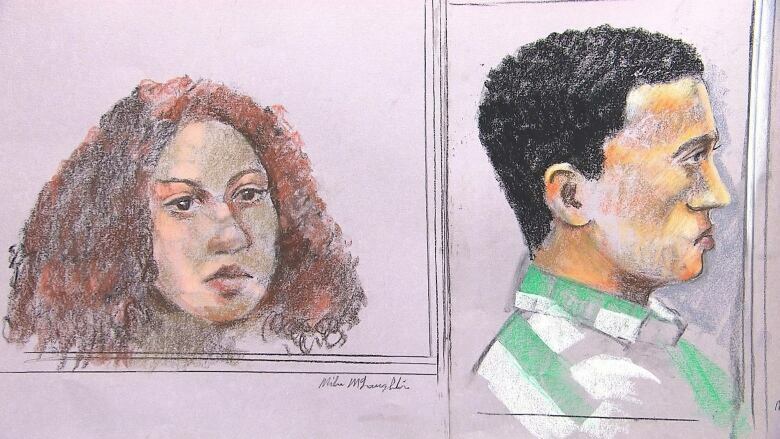 The case against Sabrine Djermane and El Mahdi Jamali, a Montreal couple accused of terrorism-related offences, will go straight to final arguments when the trial resumes on Dec. 4. Lawyers for the two Montrealers accused of terrorism-related offences have opted not to mount a defence in the case. Lawyers for Sabrine Djermane and El Mahdi Jamali told the jury Monday afternoon they would not call witnesses nor present any evidence. That means the case will proceed directly to final arguments, scheduled to begin Dec. 4. Earlier Monday, Superior Court Justice Marc David withdrew one of the four charges against Djermane and Jamali — the charge of facilitating a terrorist act. Attempting to leave Canada to commit a terrorist act. Possession of an explosive substance. Committing an act under the direction of, or for the profit of a terrorist organization. The defence made the request after the prosecution rested its case earlier this month. The judge told the jury Monday he made the decision for legal reasons and that it should not affect the jurors' consideration of the remaining charges. Also Monday, David excused one of the jurors in the case after receiving a note from her. The judge said he would keep the note confidential, but that the juror had "deeply personal" and "justifiable" reasons for making the request. That means the 11 remaining jurors will now consider Djermane and Jamali's fate. The prosecution alleges Djermane, 21, and Jamali, 20, tried to leave Canada to join ISIS in Syria. They are also accused of having a recipe and materials to make a bomb. The two had recently dropped out of CEGEP when they were arrested in April 2015.